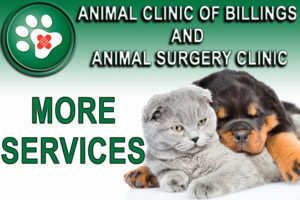 At the Animal Clinic of Billings and Animal Surgery Clinic, we believe strongly in preventing and managing anxiety and pain in our patients. We can help alleviate pain caused by surgery, chronic arthritic pain, and acute pain as in the case of trauma. Certain medications, analgesics, or acupuncture may be needed in addition to physical rehabilitation therapy (PRT) to help patients be comfortable. A dog suffering from back pain receives electronic acupuncture treatment from veterinary practitioners Kay Lynn Allen and Laura Moore at the Animal Clinic of Billings. We all know that pain hurts, but pain has many other detrimental effects on the body. It slows healing, decreases activity, causes behavior changes (such as aggression, anxiety, and depression), and it worsens diseases like arthritis and potentially some cancers. Not to mention, pain ultimately interferes with the bond between you and your pet. In order to combat those effects, we use an advanced, multimodal protocol to prevent and treat pain in your pet. Whenever possible, we use a combination of local anesthetics, NSAIDs (non-steroid anti-inflammatory medications), and narcotic pain relievers. At the Animal Clinic of Billings, we believe that identifying and relieving pain is important to the recovery of your pet. Therefore, pain management is an important aspect of our intra- and post-surgical protocols. At discharge, we can also send additional pain management medication home with you and your pet after providing a thorough explanation of its proper use and dosage.